Jim Thomas is a Washington, D.C. attorney, author, speaker, trainer, and one of the most acclaimed and respected negotiators in the United States. 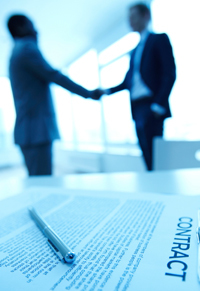 For the past 30 years, Mr. Thomas' law practice has focused exclusively on negotiating. His negotiating experience encompasses domestic and international business transactions, arms control, the environment, trade and diplomacy, real estate, mergers and acquisitions, labor relations, criminal and family issues, and a host of other fields. His clients include most of the Fortune 500, as well as nonprofit groups, professional and trade associations, and federal, state, and local governmental agencies. Among Mr. Thomas’ negotiating projects are the Phelps Dodge-Freeport, Symantec-Veritas, SKF-Macrotech, and Capitol One-Hibernia acquisitions. He was a member of the United States’ negotiating team in the successful Intermediate Nuclear Forces (INF) negotiations with the former Soviet Union. He also serves on the United States’ WTO (formerly GATT) negotiating team. In 1977 Mr. Thomas began a series of pre-negotiation briefings for clients that had the fortuitous side effect of dramatically improving attendees’ negotiating skills. This material was made available to the general public as a workshop in 1982. 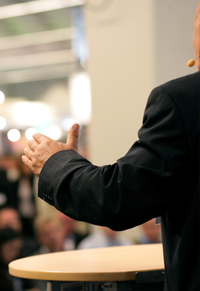 Since then, Mr. Thomas’ seminars have become some of the leading negotiation training programs in the world. They are recipients of a number of ASTD and NAPM Awards for Excellence. 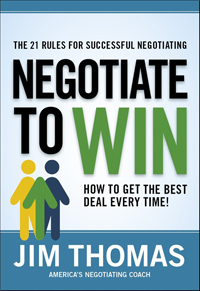 Mr. Thomas’ book, Negotiate to Win, is a HarperCollins international bestseller in 13 languages. Mr. Thomas is the author of scores of articles about negotiating, a frequent guest on television and radio, a regular commentator on Fox News and MSNBC, and a popular speaker and trainer for corporate, government, trade, and professional groups. Mr. Thomas is a member of the faculty of the University of Washington’s Pacific Coast Banking School and the Graduate School of Banking Louisiana State University. Mr. Thomas is a graduate of the University of California at Los Angeles and The Georgetown University Law Center. He and his wife Jacqueline reside in Washington, DC and on Sunset Beach Island, North Carolina.